Last Saturday, Workers’ Party Youth Wing (WPYW) organised a public forum titled “The influence of online media on Singaporean youths”. 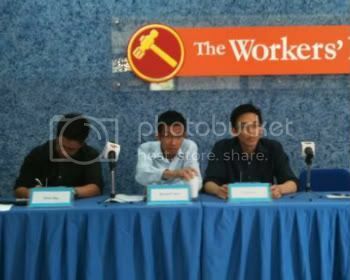 It is the 6th Youthquake Forum, part of a forum series founded by the WP Youth Wing. The first speaker was Elvin Ong, a business undergraduate at SMU. 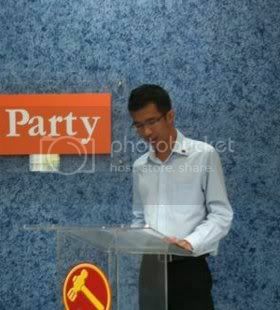 The second speaker was Bernard Chen, history undergraduate at NUS. He is also the WPYW Secretary. The final speaker was Terence Lee, a journalism student at NTU who is also the former News Editor of The Online Citizen (TOC). “I am a consumer. I am the one who makes the choices of what websites to surf, what to read, what not to read and what interests me,” said Elvin Ong. According to him, the online media must know their audience to ensure that the materialised efforts and objectives are not “intellectual masturbation”. Online media such as TOC should communicate the nature and the objectives of their writers in order to better communicate its agenda. Citing Facebook as an example, Bernard Chen noted that it is common to see the people joining 2 groups that have opposing viewpoints. As an anti-establishment tool, the online media is capable of changing our perspectives over time. However, Bernard also put forth that internet may not necessarily change the seemingly apathetic nature of youths today. Bernard believes that face-to-face meetings trump the online avenue. Such up-close meetings provide a personal insight to the thinking and mindset of the people. While he acknowledges that the online medium could just be a façade and does not necessarily influence policies or the parliament, it is nonetheless a tool that amplifies the little voices. This consequently encourages action and participation. Terence Lee commended government ministries for jumping onto the bandwagon to interact with netizens, citing the Ministry of Health as an example. However, he highlighted that a barrier is nonetheless present with disabled comments which disallows a direct interaction. Although alternative media such as TOC and Temasek Review are gaining more recognition amongst the people in the statutory boards, Terence acceded that TOC is not capable of creating change. The onus remains on Singaporeans. The dichotomy between the online and offline media was a heated topic raised by the floor. Whilst online provide the voices, it still remains a closed door culture. Elvin put forth that the question was not substantial. Terence added on that the purpose of journalism is to put forth views and that the issue at hand is in fact the disconnect between alternative and mainstream media, not that of the online and offline media. On the question if the internet is an empowerment or communication tool, Bernard reasoned that the essence of the message is more important. Nonetheless, the internet is a viable tool for political action and to put forth political or even social causes that is overlooked by the offline media. According to a survey on GE 2006 voters, respondents revealed that people around them were more influential on their voting choice than door-to-door visits by election candidates. The notion of habit was highlighted where it has become a habit that the first material of reference is the newspaper. To this, Elvin responded by making references and quoting Deputy Prime Minister Teo Chee Hean on how the prevalence of diverse opinions may not necessarily be a good thing while giving examples of sensational tabloids such as The Sun. It may actually cause readers to eventually revert to Straits Times which is seen as the main source of news. When asked to comment on the credibility of Straits Times, Terence said that Straits Times had put in efforts to put forth alternative view points and less propaganda in the reports, in contrast to the level of propaganda found on the Straits Times 15 to 20 years ago. Financial constraint was raised when speakers were questioned on the probability of the alternative media on bringing about news. Inevitably, the issue of political education was raised by the floor. A participant from the floor questioned the suitability of comparative political systems as a syllabus given that political education is not for training students into political scientists. Elvin said while the syllabus is a contentious issue, one should trust the civil service to evaluate all possible options. The session however ended with some unanswered queries such as the involvement of online media during the cooling off period which cannot be ascertain due to the indefinite nature of the “cooling-off period”. And on the impact of social media such as the Facebook on the decisions made in parliament, Terence felt that it was still uncertain as the impact will be seen in the younger generation where such social online media influences.